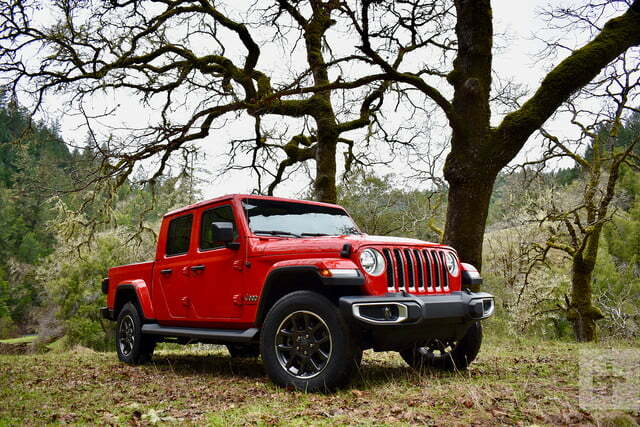 The 2020 Jeep Gladiator goes on sale later this year with a starting price of $35,040, the automaker announced today. Fuel economy numbers have also been revealed for the V-6, and they’re in line with other similarly equipped midsize trucks. The Gladiator has a much higher starting price than rivals, but it comes standard with a V-6 engine and four-wheel drive. The Sport S trim, which gets a few extra goodies over the base model, goes for $38,240. Step up to the Overland model, priced from $41,890, and you’ll receive power door locks, two-piece fender flares with body color insert, auto headlamps, side steps, upgraded tires, and other features. Rubicon models cost $45,040 and receive beefy 33-inch tires, upgraded cloth seats, and a Rock-Trac 4×4 system with heavy-duty axles and locking differentials. The Gladiator launches with a 3.6-liter Pentastar V-6 engine making 285 hp and 260 lb-ft of torque. When paired to the standard six-speed manual transmission, the truck gets an EPA rating of 16/23/19 mpg city/highway/combined. With the eight-speed automatic, the Gladiator trades one highway mpg for a small boost in city fuel economy: 17/22/19 mpg. The Gladiator’s fuel economy numbers are competitive with its rivals. The 2019 Toyota Tacoma gets 18/22/20 mpg when equipped with a V-6 engine, four-wheel drive, and an automatic transmission, while the Chevrolet Colorado nets 17/24/19 mpg in V-6 automatic 4WD trim. The 2019 Ford Ranger is only available with a turbocharged 2.3-liter four-cylinder, and its fuel economy is higher at 20/24/22 mpg with four-wheel drive and a 10-speed automatic. This isn’t the last we’ve heard from Gladiator. In 2020, the truck will be available with a 3.0-liter EcoDiesel V-6 engine producing 260 hp and 442 lb-ft of torque.